I’ve talked recently with Terry Brown (Rush, Fates Warning producer). Maybe you know him. Terry used to work at Olympic Studios since 1967. He was engineer like me and in one or two sessions when I wasn’t available he replaced me. 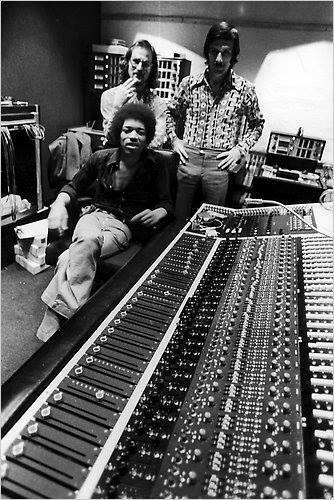 I think he worked with Jimi (ed: Hendrix) one or two times. Recently, you released your photographic book “From The Other Side of the Glass”. What was your motivation to start taking photos during the sessions? The book isn’t out yet, we are planning a documentary picture film as well. There are the photos in your site and they look great. The website isn’t up yet in full. We are planning to launch it soon. The idea came up when another engineer was holding a camera and I asked him if he wants to sell it to me. So, I bought the camera for 10 pounds, a large amount of money then and I started taking photos of the people. And I started practicing in it. I was an amateur but I liked doing this. They were all musicians and there was not a subject that I was taking photos. You know, I did a lucky job, I’m happy that I worked with Jimi Hendrix, Rolling Stones, Traffic and all those bands. The musicians, the managers, all the people didn’t have any problem of taking pictures of them, he-he! That’s how I begun taking photographs and I took photographs all the way up to late ‘72, early ’73. That period of time was very intensive and creative and I call that period from ’65,’62 the “Golden Age of Rock’ n’ Roll” and I’m lucky that I was at right place at right time. You were very lucky, indeed. With Waves you released a series of Audio Plug-Ins. How difficult was technically this project to develop it? With Waves the situation is interesting because it took a long time to finish it and the concept was the new bands to sound like the original recordings of Jimi Hendrix, Led Zeppelin and others. To create the Plug-Ins he had to consider three elements: the first element was: Helios, this may sound familiar to you.. Yes, it’s a Greek word (“sun” in Greek). Helios is a very big sound. So,we created the sound according to Helios.Secondly, gui-editor is a very critical part of this music, it’s about drums, guitar, bass and the whole thing. The third element is to make everything sounds like it was in tapes. But today’s bands can’t afford the use of tapes, like a 24-track tape because they are very expensive, so we tried to create a simulator. That was very, very hard: technology, research, it was very expensive, it took 2 years of developing. The simulator does what we were doing in the past and all the three elements: Helios, gui-editor and the simulator is very pretty much about how is created a Plug In. You may know, there is a trend now with the analog recordings: White Stripes, etc (Witchcraft, Electric Wizard).. So,it will be useful to newer bands which are interested in analog sound. 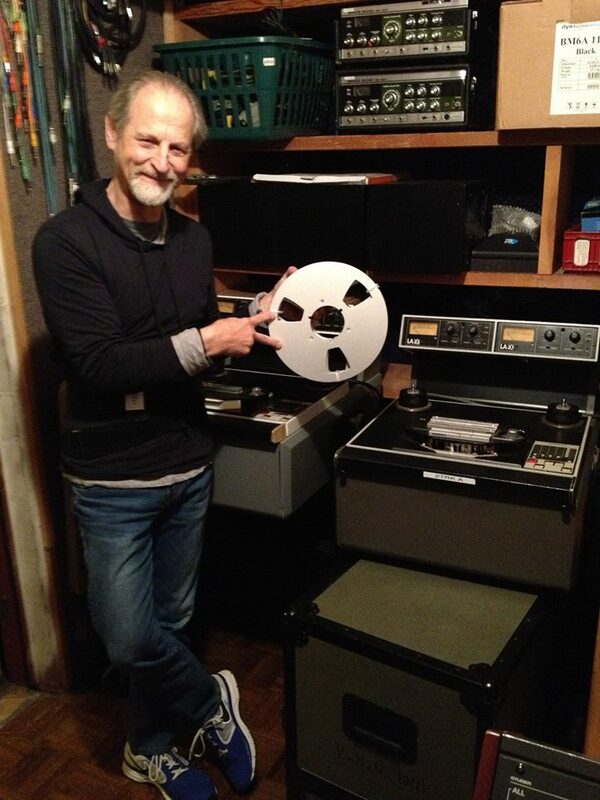 I still record in analog tapes, if they can afford it… I use tapes 24-track,16-track console and we transfer it using VRL.. So we are all the way around: analog and digital. Do you think your love about technology since very young age, made you later so important behind the board? You have to understand that I’m not really into technology, I use technology to get the sound. I mean the curiosity about technology. The curiosity started as a musician. I was trained in classic music when I was in South Africa. My co-patriots were very generous in education and then as a teenager I got into jazz, rock’ n’ roll and when I went in England in ‘60s and I started as an engineer I could combine my love in electronics and technology. I’m not a technician, I love what technology can do, but you can’t say I’m a technician. How important was for your later career the period you spent at Pye Studios? At Pye I was for a short period, I think about a year. Pye was an important experience because there was my teacher,my mentor a guy named Bob Auger, probably one of the greatest recording engineers, he did pop recordings, rock recordings, different kind of stuff. Which are the current projects, you’re involved in? Are you doing any recordings this period? Oh God, I’m always involved in numerous recordings. First of all, there is a very long Jimi Hendrix project:4 CDs of live shows from San Francisco, in Winterland in 1968, 3 nights, 6 shows, 2 shows per night. We have all these shows, will be represented by 4 CDs plus a very interesting interview he did after one show at Boston Garden. There will be also a reissue of another Jimi live CD that was released before 10-12 years. I’m working with a band from Croatia, called Wasting Generation. I‘m also working in a tremendous project called Eternal Defense which contains a comic book, animation , orchestra and heavy metal music. Who will be the musicians? Joe Satriani and a lot of other musicians. Will be Steve Vai among them? He ‘s a Greek guy! I’ve talked with him! You wrote “Hendrix: Setting the Record Straight” with John McDermott. How difficult emotionally was to write all that stuff? That was in 1992-93. With John McDermott we released two books: that one and “Jimi Hendrix Sessions”. Both books had a lot of interviews, a lot of research.I think “Setting the Record Straight” tells the truth, in comparison with some other books that aren’t quite the same. How hard process is to collect and made “listenable” all the archive work Jimi Hendrix left? We know all the work he has done. We have all the tapes. It requires a lot of research, a lot of listening. I spend a lot of time to make sure we have the best possible performance. I spend a lot of hours making the sounds hear contemporary,with a more contemporary edge. I’m very happy with the new company, Sony Legacy, they do a great job. We have the master tapes, they put the album out, they do the advertising and promoting it. How much “freedom” did you have when worked for Led Zeppelin albums? Did Jimmy Page status in ‘70s affected your collaboration with him at studio? Working with Mr Page was always a pleasure. I mean the guy knew what he wanted very exact, very demanding. He knew what he wanted to hear and I made it that he wanted to hear. I tried to give them a big sound, so I guess I did good work if you think that I did 5-6 albums with them. I have a deep respect to Jimmy and to the whole band. I’m very honored to be part of their legacy. Jimmy Page was the producer. You were the engineer. Which exactly was the role of John Paul Jones at studio? He did only arrangements? I can’t say that. Led Zeppelin couldn’t exist if there weren’t those four members. Look what happened after John Bonham’s death: They had to stop. He was the best rock n’roll drummer in the world without question. John Paul Jones..
(I interrupted him). I’m a huge fan of John Paul Jones! I knew John Paul Jones as long as I knew Jimmy Page, from the period they were session musicians. John Paul Jones was a great teamwork player. He had an edge and he were taking what Jimmy Page did,expanded it and made it more “lush”. It pushed Jimmy’s ideas further, he did the arrangements, he was a phenomenon. Jimmy didn’t do arrangements, but he had the ideas. 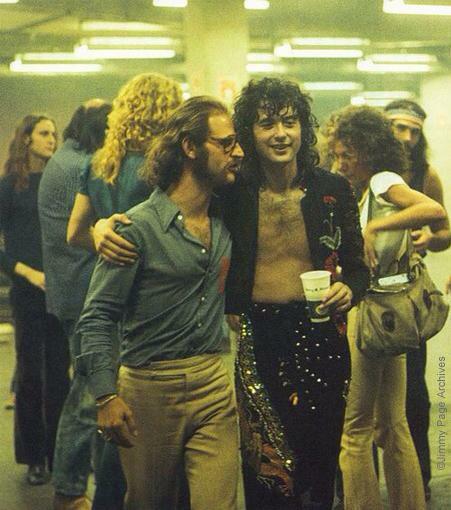 You can’t imagine Led Zeppelin with other band members. You can’t imagine them without Robert Plant’s voice. One compliments the other. The same with The Beatles. The was always tension between John (Lennon) and Paul (McCartney).The same with Jimmy Page and Robert Plant. If you haven’t tension,you can’t produce. The same thing with Mick (Jagger) and Keith (Richards) in Stones. The same with The Kinks, Ray (Davies) and Dave (Davies). All rock’n’roll bands should have that tension. There is a lot of buzz among Led Zeppelin fans about how much “live” were in fact “The Song Remains the Same” live album and film (Look the “Garden Tapes” site). Which is the truth? I don’t know exactly. I think Robert’s voice wasn’t quite strong towards the end of the shows and I guess there was some correction. I can’t say that. I wasn’t at those shows, I did the mix afterwards. I can’t say that straight. Two days ago I talked with Bobby Whitlock from Derek and The Dominos. Yes, I have recorded them live. Yes, their live albums. Do you think that band should have lasted longer (it lasted only 1 year)? You know Eric Clapton (Ed: I wish I knew him).. He always wants to move on. When you first met KISS band members did you believe that they had the potential to become a so successful band? KISS guys were interesting. I knew them when they signed their first record deal. Their manager at time took me at one of their live shows. They had something, I didn’t know exactly what but they had it. I said “Wow! They are a good band and they could make it later with a lot of work” . During ’80s you produced many metal albums (Anthrax, Loundness). Were you familiar with that kind of music? Yes. I see it as a normal transition from hard rock. If the band executes its parts well and they have melody, I don’t have any problem. I’m not really into speed metal. Previously we talked about Derek and The Dominos. Their drummer murdered his mother with a hammer. Did you get shocked when you learned about it? I didn’t know about it for years. I learned it recently. I’m not interested in anything except music. I’m not get involved in politics. I’m interested only in music. I don’t leave any other destraction. You’re the person you recorded many of the greatest live albums in music history. For which live album you’ve done, you’re most proud of? Ppffffff. It’s a tought question. Ι’done many..
You’re the best ever live album producer. It’s hard to say that. I could say “Frampton Comes Alive”.. But that with the biggest impact Woodstock. It was monumental. Who was the most talented musician you have worked with? Maybe Steve Winwood? If there would be one, would be Jimi Hendrix. What music do you hear in your spare time? I don’t have any spare time (laughs). I’m in Los Angeles and you drive a lot and you have the radio on. So, I’m listening to NBR, National Radio, a lot of classic music, some jazz. I do so much rock n’roll at studio, so I take a break outside of it (laughs). You lived and worked during 60s and 70s. How important was the contribution of producers like George Martin (The Beatles producer), Shel Talmy (The Who. The Kinks producer), Mickie Most (The Animals, Donovan) and Jimmy Miller in modern music? Let’s talk about Jimmy Miller (Rolling Stones producer). He was the most influential for my career. I wanted at young age to be like Jimmy Miller. He took a band like Stones and made some of the best records that they have ever been made like “Beggar’s Banquet” .He was so talented: he was producer, technician, singer, songwriter, drummer. He had the great ability to realize what they were looking for and I have a deep respect for that guy. And for all the other guys. I think I took a little bit from all of them. George Martin was very important without question. They were all very important. Which other producer’s work would you like to be yours? Maybe (Pink Floyd’s) “Dark Side of The Moon”? Not necessary. I’m very happy with the albums I have already produced. Which exactly was Chas Chandler’s (The Animals bassist, producer and first manager of Jimi Hendrix) role in Jimi’s career? It has been written that he became millionaire because of Jimi. Is that truth? I don’t believe that Chas Chandler became a millionaire. I doubt that.. He brought Jimi in England. He worked with him, he helped him a lot, he pushed him into more pop songwriting. If there wasn’t Chas, it would take longer for Jimi to become recognizable. You may know before the death of Jimi, there was talk to bring Chas back as manager and to have the old team back: Jimi, Chas and me. Not yet. My parents have been, my friends,my brothers, all my family. If you have a really good rock band and the budget call me. I’ve heard there are two good studios in Greece. One is in an island. Yes, in Santorini where Joe Bonamassa recorded “Black Rock” album. If there is a good rock band and the budget I will be recording in Greece.. tomorrow. I don’t think there is a so good rock band in Greece. Maybe Gus G. band Firewind, I ‘ll tell him. 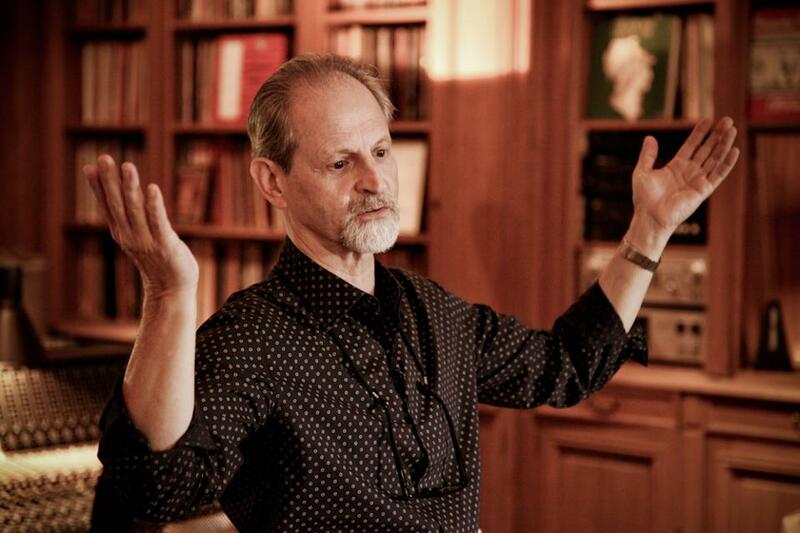 I huge “THANK YOU” to Mr Eddie Kramer for his time and his great answers.